For overscheduled professionals looking to incorporate mindfulness into their daily lives, this step-by-step guide draws on contemplative traditions, modern neuroscience, and leading psychology to bring peace and focus to the home, in the workplace, and beyond. Designed for busy professionals looking to integrate mindfulness into their daily lives, this ultimate guide draws on contemplative practice, modern neuroscience, and positive psychology to bring peace and focus to the home, in the workplace, and beyond. In this enriching book, noted mindfulness expert and international teacher and business leader Laurie J. Cameron - a veteran of the Search Inside Yourself Leadership Institute, a Senior Fellow at the Center for the Advancement of Well-Being at George Mason, and 20-year mindfulness meditation practitioner- shows how to seamlessly weave mindfulness and compassion practices into your life. Timeless teachings, compelling science and straightforward exercises designed for busy schedules -- from waking up to joy, the morning commute, to back-to-back meetings and evening dinners - show how mindfulness practice can help you navigate life's complexity with mastery, clarity and ease. Cameron's practical wisdom and concrete how-to steps will help you make the most of the present moment, creating a roadmap for inner peace - and a life of deeper purpose and joy. Leadership coach and teacher LAURIE J. CAMERON combines Eastern traditions, positive psychology, and neuroscience to help bring mindfulness to business, education, and parenting. In addition to founding PurposeBlue, a leadership company dedicated to mindfulness, Cameron is a certified teacher for Google's Search Inside Yourself Leadership Institute, which uses mind training and modern technology to help professionals thrive. With 25 years of international management consulting and business leadership experience, Cameron is a sought-after speaker in the United States, Europe, and Asia and has worked with such companies as Google, Deloitte, NASDAQ, Scripps Networks, Accenture, Blue Shield, Williams-Sonoma, Chevron, and H.J. Heinz. "A wise, delightful and life-changing book, combining inspiration with delicious, practical ways to make well-being and care come alive in your day." "You will love this book. The Mindful Day is a refreshing, practical approach to applying the skills of mindfulness and compassion to live with more wonder, love and joy. In a voice that is warm and clear, Laurie Cameron offers inspiring guidance, compelling science, and illuminating stories that will transform your experience, and your life." “The ability to design and implement a day focused on what is essential is the essence of a meaningful life. This book provides a delightful guide to doing just that. Read this and gently apply it day by day. You will never regret it." —Greg McKeown, author of New York Times bestseller "Essentialism: The Disciplined Pursuit of Less." 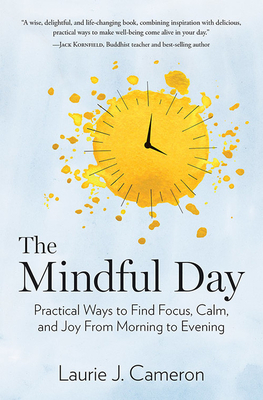 "Laurie Cameron has created a gem with The Mindful Day by offering a practical, moment-to-moment guide for increased calm, ease and peace. This is a book to be referred to many, many times. I suggest owning several copies, one for the bedside table, the kitchen table, and the office conference room table!" "Laurie Cameron's compassionate determination to bring authentic mindfulness practice to the business world makes this book a treasury of insight for all those searching in earnest for how to live a happy, mindful life in the midst of today's non-stop, stress-saturated workplace. We are all better off for this her generous gift to the world." —Susan Bulkeley Butler, former Accenture Partner, Office of the CEO; Author of Become the CEO of You, Inc.